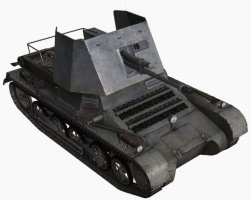 The Panzerjäger I is a German tier 2 tank destroyer. 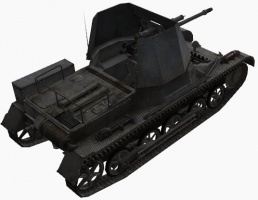 Development of the Panzerjäger I, the German tank destroyer, started in 1939 based on the Panzerkampfwagen I Ausf. B. Initially, the 37-mm Pak 36 gun was mounted on the chassis of the Panzerkampfwagen I Ausf. B. 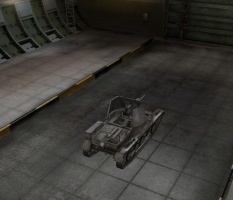 However, during the invasion of Poland, it was revealed that the gun was not effective against new vehicles. 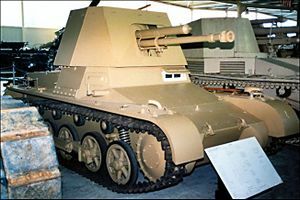 After Germany captured Czechoslovakia in 1940, the 47-mm Pak 36(t) L/43.4 (Škoda 47-mm A-5 KP ÚV vz. 38 Model A5) gun was mounted on the tank destroyer. A total of 202 vehicles were manufactured and saw action until 1943. 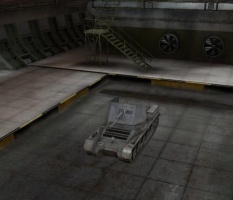 It has low engine power, making it slow and unwieldy, although it a powerful cannon: the 4.7cm L/43. Its low weight helps it rotate more quickly for faster target acquisition. 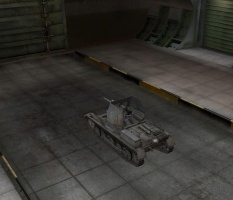 Overall, this tank destroyer can be a fun learning curve as you adapt to the differences between a TD and a tank. The Panzerjäger I leads to the Marder II. You have no real armor, so remaining hidden is key. Always use bushes and other cover. A Camouflage Net is highly desirable. Being an open-topped vehicle, the view range is pretty decent, so if you use a Camo Net, you should be able to see targets before they see you. 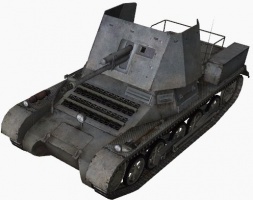 The 4.7 cm Pak 38 (t) L/43 is an immense improvement over the stock gun, providing much-needed penetration, a large increase in damage, and more accuracy, all while having near the same rate of fire. It doesn't even weigh any more. This is also the best gun available on the Pz.Kpfw. 38 (t). The Maybach HL 38 TR engine carries over from the Leichttraktor, so upgrade that immediately. 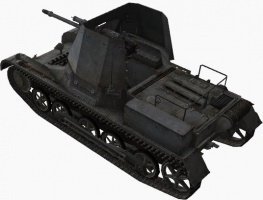 Upgrade to the 4.7 cm Pak 38 (t) L/43 right away. Panzerjaeger I in North Africa, probably in 1941. On the way to the front during the French campaign in 1940. The Panzerjäger I (German "Tank Hunter 1") was the first of the German tank-destroyers to see service in the Second World War. It mounted a Czech Skoda 4.7 cm (1.9") PaK (t) anti-tank gun on a converted Panzer I Ausf. B chassis. It was intended to counter heavy French tanks like the Char B1 that were beyond the capabilities of the 3.7 cm PaK 36 anti-tank gun then in service, and served to extend the usable lifetime of otherwise obsolete Panzer I tanks. Over 200 were converted in 1940—41. They were employed in the Battle of France, the North Africa Campaign, and on the Eastern Front. The Panzer I's turret was removed and a fixed gunshield added to protect the armament and crew. 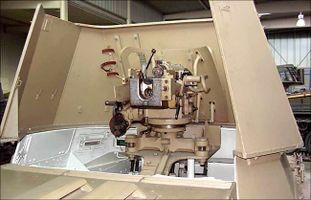 The anti-tank gun was mounted on a pedestal in the fighting compartment with the wheels, axle, and trails removed; it retained its original gun shield. It normally carried 74 anti-tank and 10 HE shells. Total production was 202 vehicles. Alkett produced the first series of 132 in 1940. Ten of the second series of 70 were assembled by Alkett, while the remainder were assembled by Klöckner-Humboldt-Deutz in 1940 and 1941. 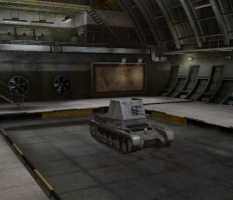 Vehicles in the second series are recognizable by their seven-sided gun shield while the first series had a five-sided shield. The vehicle's formal name was 4.7 cm PaK(t) (Sf) auf Panzerkampfwagen I ohne Turm, which translates as "4.7 cm anti-tank gun (Czech) on turretless Pz.Kpfw. I". The Panzerjäger I's were generally organized into nine-vehicle companies, with three companies per battalion. For the French Campaign (only), Anti-tank Battalion (Panzerjäger-Abteilung) 521 had only six vehicles per company. With two exceptions, they were only used by independent anti-tank battalions during the war. However, after the Balkan Campaign, one company was assigned to the SS-Brigade Leibstandarte der SS Adolf Hitler and another to Panzerjäger-Abteilung 900 of Lehr-Brigade (mot.) 900 ("900th Motorized Demonstration Brigade") in preparation for Operation Barbarossa. Ninety-nine vehicles equipped Anti-tank Battalions 521, 616, 643, and 670 in the battle for France. Only Anti-tank Battalion 521 participated in the campaign from the beginning, as the other three were still training until a few days after the campaign began, but they were sent to the front as they finished their training. Twenty-seven Panzerjäger Is equipped Anti-tank Battalion 605 in North Africa. It arrived in Tripoli, Libya, between 18 and 21 March 1941. Five replacements were sent in September 1941, but only three arrived on 2 October as the others had been sunk on board the freighter Castellon. At the start of the British Operation Crusader, the battalion was at full strength, but lost thirteen vehicles during the battles. Four more replacements were sent in January 1942, so that it mustered seventeen at the beginning of the Battle of Gazala. Despite the shipment of another three vehicles in September/October 1942, the battalion only had eleven by the beginning of the Second Battle of El Alamein. The last two replacements received by the battalion were in November 1942. Anti-tank Battalions 521, 529, 616, 643, and 670 were equipped with one hundred thirty-five Panzerjäger Is for Operation Barbarossa. By 27 July 1941, Anti-tank Battalion 529 had lost four Panzerjäger Is. On 23 November 1941, it reported that it still had sixteen vehicles, although two were not operational. Most do not appear to have survived the Winter of 1941/42 as Anti-tank Battalion 521 reported only five on hand on 5 May 1942. Anti-tank Battalion 529 had only two on strength when it was disbanded on 30 June 1942. Anti-tank Battalion 616 seems to have been an exception, as it reported all three companies had Panzerjäger Is through at least the Autumn of 1942. The only surviving Panzerjäger I. It is kept at the Koblenz Tank Museum , Germany. Fighting compartment of the surviving Panzerjäger I. This page was last modified on 10 January 2018, at 22:06. This page has been accessed 189,416 times.